Language is a prison in this cerebral play about oppressive society. 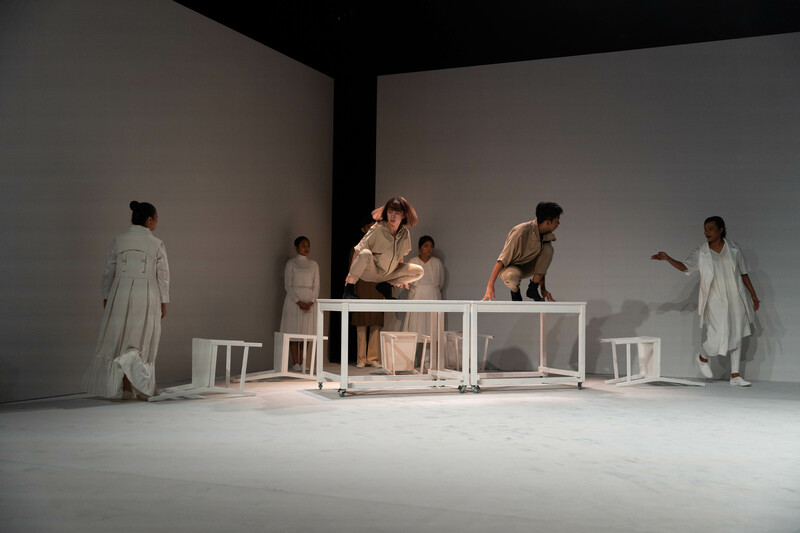 In line with her penchant for cerebral scripts heavy on text, director Edith Podesta’s efforts at bringing Austrian writer Peter Handke’s Kaspar to life with the help of NAFA’s BA Theatre students is a valiant one, no easy feat given its absurdist, non-linear flow and often nonsensical, non-sequitur language. Loosely inspired by the story of Kaspar Hauser, a boy said to have been raised in isolation in a darkened cell with knowledge only of a single sentence, Kaspar becomes an exploration of the nature of language itself, and all the joys and pains that come with it. In its prelude, a video of cast members prescribing instructions on how best to think, perform and live is played, often absurd, often seemingly irrelevant, and drives home the aims of the script to establish and unveil language’s insidious side effect of imposing rules and convention upon individuals when conforming to the masses, represented by language. 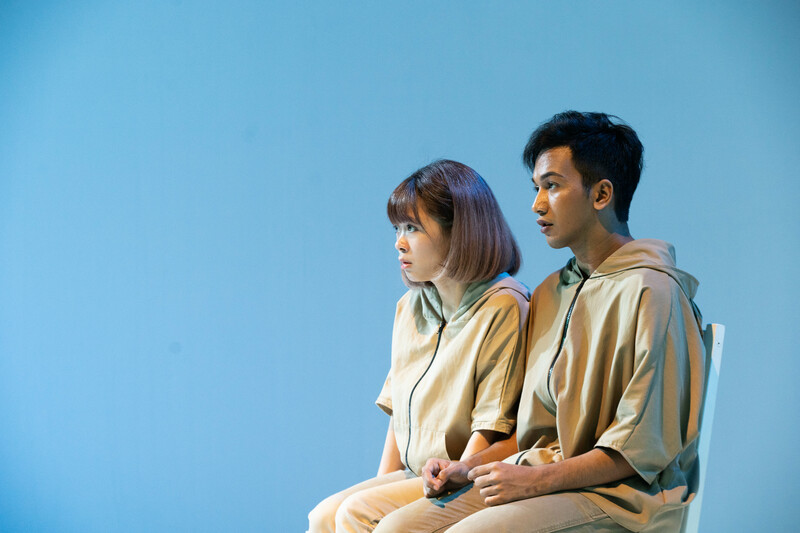 When the play itself begins, the titular Kaspars (played by two actors, Haiky Zulkifli and Belle) crawl out from under a table to find themselves in a blank white room. 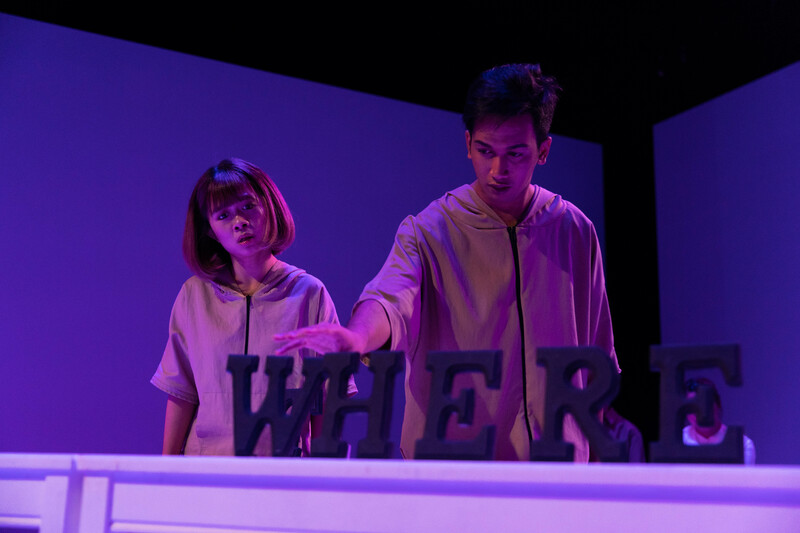 Dressed in hoodies with felt animal ears stitched on and armed only with a single sentence (“I want to be someone like somebody else was once.”), they are immediately othered, animal-like in their frenzied movements on all fours across the stage. 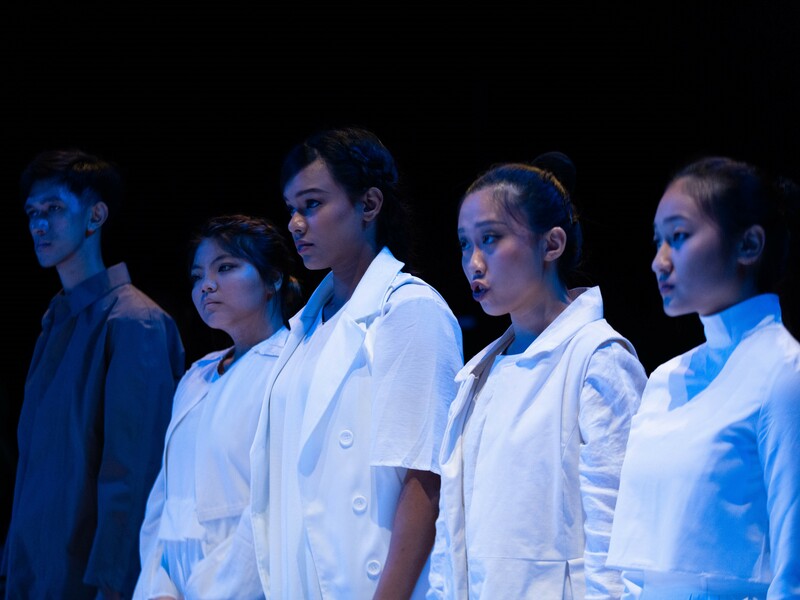 It’s not long before they’re set upon by a group of five overlords dressed in clean, pristine white (Shahina Farouk, Joreene Lim, Zakee Chan, Hayley Meng and Huang Cuishi Tricia), barking instructions at them about the need to learn language and integrate into society. Visibly shaken and distressed by the prospect, the Kaspars’ single line of speech becomes garbled, rearranged and silenced as they metamorphose and learn language, painful at first, yet sweet, given enough time to get used to it. Yet, Kaspar is never completely comfortable with the idea of language, with the remainder of the play spent testing its limits and waxing philosophical about the possibilities it offers. One is reminded of the Sapir-Whorf hypothesis (one that was also seen in blockbuster sci-fi film Arrival) positing how the structure of a language determines or greatly influences the modes of thought and behavior characteristic of the culture in which it is spoken, thereby causing the Kaspars’ entire understanding of the world to shift because of the way language restricts them in describing or comprehending it. With the language being English in particular, perhaps one of the most confusing languages to learn with its ever shifting rules and meanings, the Kaspars point out the way language can often occupy double meanings, often used as euphemism for far more nefarious or sinister goals (further emphasized by Brian Gothong Tan’s chilling monochromatic images of violent or torturous scenes). Language then, is presented as both freeing and limiting, by opening up a means of communications that forces one into following a set of pre-established rules as cemented by society. A play anchored in exploration rather than straight narrative as it works to deconstruct language and seek to find the ways in which one can manipulate it (or how one can be manipulated by it), it is difficult to find an emotional entry point to latch onto in order to feel attached to the play and its characters, while its language often works more to confuse and confound, reliant on audiences to catch snatches of meaning and treat Kaspar as a mood piece rather than a fully comprehensible whole. In a world that has recently found an obsession with petite Japanese organizing consultant Marie Kondo, it is perhaps useful to view Kaspar through a Konmari lens and ask the quintessential question: does language spark joy? The moments Kaspar works best are when the actors reveal language’s failure to communicate, and words themselves lose all meaning. Choosing to abandon complex lexicon and huddling back into the safety of their original sentence bereft of the clutter knowledge imbues us with, we are left with a somewhat pessimistic message that seems to adhere to the old adage that ignorance is bliss. For Kaspar, language does more harm than help, championing the joy of a hermit’s life distanced from the confines of oppressive society, a message that seems naive at best as both Kaspars end completely disillusioned, choosing instead to crawl back to the dark comfort of their hole away from the world.